In order to come up with the items on the list, we did our research by checking out recommended online sellers of cigarettes such as CigsSpot.com, CiggiesWorld.ch, and Dutyfree.io. We also looked into some of the comments at the cigarettes sub on Reddit to see which brands are considered premiums in different countries. Because cigarette prices vary depending on the country, we will only mention the online prices of these brands to give you an idea how expensive they can be. Some of them are considered cheap and affordable in some countries. But for the most part, they are considered the most expensive cigarette brands and usually go for at least $5.00 per pack in many countries. Note: Shipping fees are excluded in the prices mentioned on this list. Product availability and prices may change at any time. Karelia is a Greek cigarette brand produced by Karelia Tobacco Company, the largest tobacco manufacturer in Greece. Founded in 1888, the company exports its products to more than 65 countries worldwide. It is headquartered in Kalamata, Greece and produces both cigarettes and cigarillos, a small cigar. Karelia offers different kinds of cigarettes, including Karelia Slims, Karelia Cream, and Karelia Blue. Known for their rich taste, Karelia cigarettes mostly appeal to men, though the brand also has a newly launched product for women, the Karelia Ome Superslims. Perhaps the most authentic product on the roster is the George Karelias and Sons, which comes in a very distinct and classy package. In some countries, Karelia cigarettes are actually pretty cheap, going for less than $5 per pack. But in most locations, the brand is among the most expensive premium cigarettes. At CigsSpot.com, Karelia cigarettes are available for $3.70 per pack or $37 per carton. Kent is an American brand of cigarettes owned by R. J. Reynolds Tobacco Company, the second-largest tobacco company in the US. The company is owned by British American Tobacco, producer of other popular cigarette brands such as Pall Mall, Dunhill, and Lucky Strike. Introduced in 1952, Kent was originally being manufactured by Lorillard Tobacco Company. The brand was named after a former company executive, Herbert Kent, and was once the most demanded cigarette brand in Romania a few decades ago. Kent is notable for being the first popular filtered cigarette. Known for their excellent taste and top quality filter, Kent cigarettes are available at CigsSpot.com for $3.90 per pack, with the most expensive being the Kent Convertibles, which are available for $4.00 per pack. Over at CiggiesWorld.ch, the most expensive pack of Kent cigarettes is priced at $6.60. Produced by Philip Morris USA, Marlboro is one of the most popular cigarette brands in the world. The brand is known for its easily recognizable billboard ads, which typically feature a cowboy with a cigarette. The cowboy is commonly referred to as the Marlboro Man, originally conceived in order to make filtered cigarettes more appealing to men. Back in the day, filtered cigarettes were considered feminine. But ironically, Marlboro was originally launched by Philip Morris as a cigarette brand for women in 1924. Marlboro is also a common sight in motorsport events. A top sponsor in Formula One, Marlboro is currently partnered with Ferrari, a sports car manufacturer also commonly associated with the color red. Marlboro offers different kinds of cigarettes, which includes Marlboro Red and Marlboro Lights, arguably the two most popular in the lineup. Marlboro Red, in particular, is known for its rich tobacco taste and excellent burn, one reason why it’s the preferred choice of men. At CigsSpot.com, all Marlboro cigarettes are available for $3.90 per pack, the same price range as Kent cigarettes. At CiggiesWorld.ch, the most expensive Marlboro cigarettes, the Marlboro Vintage, are available for $9.80 per pack. And at Dutyfree.io, a pack of Marlboro Red goes for $4.50. Nat Sherman is a brand of luxury cigarettes owned by Altria, one of the largest tobacco manufacturers in the world. Altria also owns Philip Morris USA, which means Marlboro and Nat Sherman are sister brands. Named after its founder, Nat Sherman was established in 1930 and runs a flagship shop in New York City. Unlike most of the cigarette brands on this list, Nat Sherman cigarettes are a bit difficult to find in most places. Heck, even online shops don’t always have them in stock – they’re not available at CiggiesWorld.ch, CigsSpot.com, and Dutyfree.io. Nat Sherman cigarettes are notable for being impeccably smooth. They taste great and have excellent an burn. Cigarette enthusiasts have remarked that Nat Sherman cigarettes burn longer than most brands, which more than justifies the expensive price tag that they come with. In most places, a pack of Nat Sherman cigarettes goes for around $10 per pack. Davidoff is a brand that never fails to get mentioned every time people talk about the most expensive cigarette brands in the world. Naturally, the brand is Swiss. If you’re familiar with the luxury goods market, then you know Switzerland is a well-known producer of all things expensive. Davidoff cigarettes are known for their excellent quality. They have the right balance of smoothness and tobacco taste. Both the Davidoff Gold and the Davidoff Classic are available for $4.40 at CigsSpot.com. At CiggiesWorld.ch, the same products go for a bit more at $5.90 per pack. And at Dutyfree.io, all the Davidoff cigarettes are available for $4.80 per pack. Davidoff sources its tobacco from multiple countries, including the Dominican Republic, Brazil, and Mexico. Named after founder Zino Davidoff, the premium brand is more known for its lineup of cigars and cigarillos than its cigarettes. Kicking off the top five is Dunhill, another popular cigarette brand. Like Kent, the brand is also owned by British American Tobacco, one of the largest tobacco companies in the world. Dunhill is known for being an expensive cigarette brand everywhere you go, so it’s a no-brainer to include it here. Notable for their classy packaging, Dunhill cigarettes are not always readily available in most places. They can be really hard to find sometimes. If you can afford it, we recommend buying them in bulk to save yourself the trouble of going back to far-off stores. Of course, you can always buy them at online shops if you’re willing to be patient about the shipping time. There are actually two versions of Dunhill cigarettes: Dunhill and Dunhill International. The latter is notable for its larger packaging. 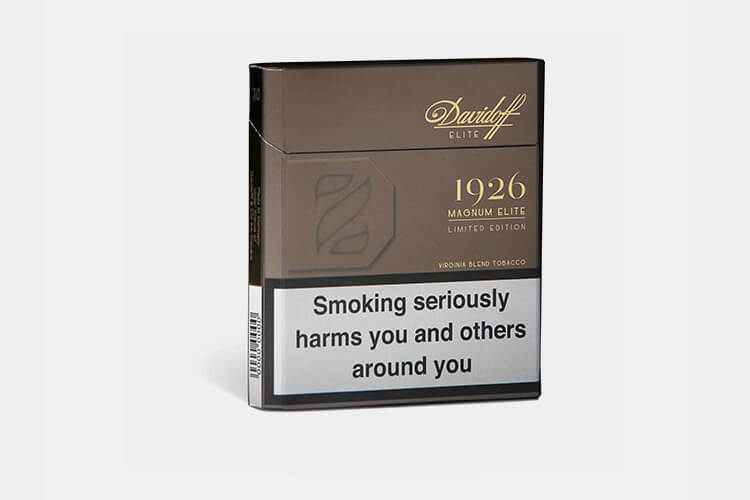 At CiggiesWorld.ch, the most expensive Dunhill cigarettes go for $9.30 per pack. At Dutyfree.io, Dunhill cigarettes are available for $5.00 per pack. Parliament is another cigarette brand owned by Altria, owner of the popular Marlboro brand. The brand is known for being one of the few cigarette brands to use recessed paper filters, which was originally conceived as an ad gimmick back when cigarettes didn’t have filters. The filter on Parliament cigarettes allows smokers to fully experience the flavor, one of the main reasons why the brand is so popular among cigarette aficionados. Apart from having a rich and flavorful taste, Parliament cigarettes are also notable for being smooth with the right amount of kick. CigsSpot.com offers three variants of Parliament cigarettes: Night Blue, Aqua Blue, and Silver Blue. All of which are available for $4.50 per pack. At CiggiesWorld.ch, a Parliament Hybrid 2 in 1 is available for $8.30 per pack. And at Dutyfree.io, all Parliament cigarettes are available for $5.00 per pack. Vogue is probably one of the least recognizable brands on this list. The brand is also owned by British American Tobacco. Vogue is primarily marketed toward women, with the Vogue Superslims and Vogue Superslims Menthol leading the charge. Compared to cigarettes from other major brands, Vogue cigarettes are a bit light. Heavy smokers likely won’t get a kick out of Vogue cigarettes for sure. But on the bright side, they have an enticing flavor, which should excite those who are all about flavors. Vogue cigarettes are available for $4.10 per pack at CigsSpot.com. The Vogue Superslims Menthol is available for $5.60 per pack at CiggiesWorld.ch. Introduced in 1879, Sobranie is one of the oldest cigarette brands in the world. It is being produced by the Gallaher Group, a tobacco company based in England, which is owned by Japan Tobacco, one of the leading tobacco companies in Japan. Sobranie specializes in premium cigarettes and offers a wide range of products, including Sobranie Cocktail, Sobranie Gold, and Sobranie White Russian. The most popular is the Sobranie Black Russian, considered as one the most heavy-hitting cigarettes. Sobranie Black Russian cigarettes are housed in black paper with gold filters, giving them an easily recognizable look. They are also one of the most expensive cigarettes in the world. At CigsSpot.com, Sobranie Black Russians go for $7.00 per pack. At CiggiesWorld.ch, they are available for $12.80 per pack. And at Dutyfree.io, they are available for $5.00 per pack. Manufactured by England-based The Chancellor Tobacco Company, Treasurer is hands down the most expensive cigarette brand in the world. It is also one of the most elusive. Cigarettes produced by the brand are made of nothing but the most premium quality materials. Treasurer has a wide range of products available, including Treasurer Aluminum Black, Treasurer Aluminum Gold, Treasurer Luxury Black, and Treasurer Slims Black. The official website of the brand does not mention prices, so we don’t really know much about the cigarettes cost. But based on the prices at Love2Smoke.co.uk, Treasurer is on the uber-expensive range, with the Treasurer Aluminum Black and Treasurer Aluminum Gold going for about $67 and $60 per pack, respectively. The brand basically dwarfs all the other brands on this list in terms of pricing.